Newton's Nook Designs: Merry and Bright Holiday Kitty Card! Is everyone starting to get in the holiday mood? I'm definitely getting into making holiday cards! For this card I used that cute image of Newton getting into the holiday lights from the Newton's Holiday Mischief stamp set and colored him with copic markers. The words "merry & bright" are from the Holiday Wishes stamp set. Then I added a strip of glittery gold paper down the side and a red satin ribbon. I also added some gold glitter with a spica glitter pen - it's kind of hard to see in the photo but so pretty in real life. I tried to go with the CAS (clean and simple) look for this card. What do you think? There's still time to apply to be on our next Design Team! Do you love Newton, stamping, coloring and blogging? check out our Design Team Call post here for details! We're accepting applications until Tuesday, Nov. 26th. What a pretty card; I love the CAS look! 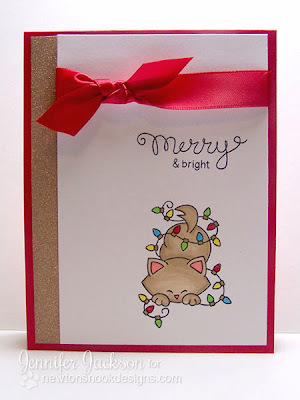 Your light-tangled glittery kitty is simply adorable! I'll be sharing some of your sweet stamps on the Advent calendar I made for my niece later this week. Newton's Mischief is just soooo cute!! Very cute kitty...love how you added the sprarkle down the side and with the glitter pen.